How to Make a Giant Chain Gun Even Deadlier: Give It a Laser Cannon! BAE System's Mk 38 chain gun was already a formidable opponent: a 250millimeter cannon capable of putting 180 rounds per minute into the air from the deck of a naval ship, strongly urging those without clearance to keep a safe distance (of about 2,000 yards). But in a tip of the hat toward what the U.S. Navy considers the future of shipboard defense, BAE and Boeing have teamed up to accessorize the Mk 38 with a laser death ray. You know, just in case. Yesterday, the two defense contractors announced that they are jointly developing a demonstration model Mk 38 with dual capabilities. The chain gun—originally designed to be manually aimed and fired—will now be remote-controlled and use an electro-optical/IR sensor ball to detect and track incoming targets, like UAVs or small watercraft (like the one that perpetrated the attack on the USS Cole in Yemen several years ago). tells us that the fiber laser system can pack up to 10 kilowatts of punch, far below what the U.S. military has previously considered weapons grade but nonetheless effective—just a few months ago an Office of Naval Research laser fried the engine of a small watercraft with a 15 kilowatt beam (though that was designed to be scaled up to a more impressive 100 kilowatts). 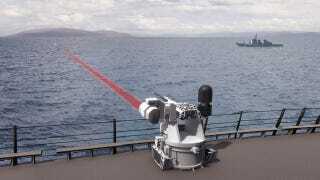 Presumably, the Mk 38's laser package could be upgraded as well, making the death ray part of the system quite a bit deadlier. Which is good, considering that sea air—rife with moisture and particulate stuff that degrades focused laser beams—compounds the many problems inherent in laser weapons systems. This article by Clay Dillow originally appeared over at Popular Science.